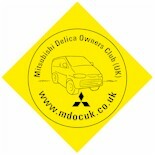 Mitsubishi Delica Owners Club UK™ :: View topic - AndyJ and his springs. Posted: Wed Mar 27, 2019 18:19 Post subject: AndyJ and his springs. Andy delivered x2 springs to my door. I put them on today - a big difference to the ride, less rolling, no sag with passengers, stiffer but nice, not too hard and also a 2inch lift. I decided to drop the trailing arms to fit them, no spring compressors required, just jacked the truck up via its rear chassis legs, disconnected the brackets holding the brake flexi and handbrake cable then placed a bottle jag on the rear of the arm for support. Then I simply took out the 24mm pivot bolt and lowered the arm on the bottle jack until the spring was free. Putting the new one in was the reverse of taking the old one out, use the bottle jack to bring the trailing arm to the position were you can slide the 24mm bolt back in. Important to clean the top and bottom spring retaining cups to ensure the first and last coil seat correctly, also they are marked on the base of the spring - this must be matched to the bottom cup. I should have done this job ages ago, having a saggy bottom is never ideal. Posted: Wed Mar 27, 2019 18:19 Post subject: Google Ads keep this community free to join!